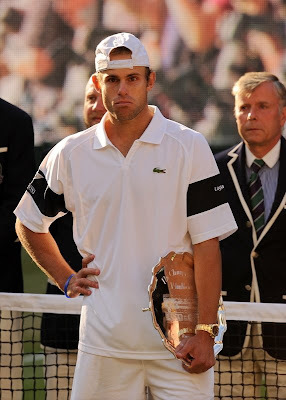 TMF beat up the unfortunate Andy Roddick over five sets and cemented his claim to be the best of all time. Unfortunately he didn’t have to beat Nadal or Murray – both of whom have winning records against him – to do it, so there’ll be a legion of doubters decrying his GOATness as usual. It just wouldn’t be right otherwise. A huge five set battle including a monster last set is what makes The Championships special. And they played briskly, none of this delaying and making your opponent wait ala Nadal or Djokovic – they both got on with it and just played tennis. Wasn’t it great? Fed actually outserved Roddick (at least by counting aces). But didn’t Andy deserve better? He plays the game of his life and still loses. His improved backhand actually won points and he broke Federer’s serve twice. And unfortunately we didn’t get to see the much vaunted and expensive roof. Hopefully Nadal and his sore knees will be there for the US Open so we can get some closure on this GOAT issue. Serena Williams has 11 and counting as she beat her banged up sister. Serena was supposed to be the tired one as she came through a hard Semi while big sis skipped past Safina with glee but it was Serena who generally cruised through the match and then dissed Safina and the WTA ranking system. "I think if you hold three Grand Slam titles you should be No. 1, but not on the WTA Tour, obviously so. 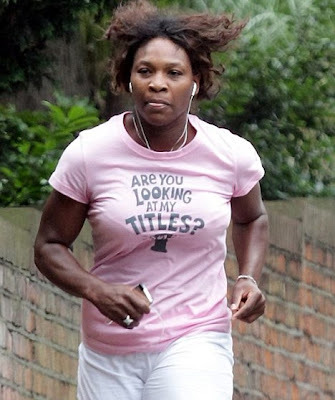 My motivation is maybe just to win another Grand Slam and stay No. 2, I guess.... I see myself as No. 2; that's where I am. I think Dinara did a great job to get to the No. 1. She won Rome and Madrid." “I’m a shover. Some people push, but I shove. That’s my mentality. I have to just hit, and I can’t help it. It’s just hard to change my mind,” said Venus.